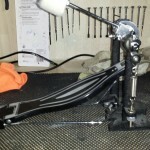 All that is required to perform a Cocktail Pedal Conversion is about 10 minutes, a few tools and a slightly technical aptitude. 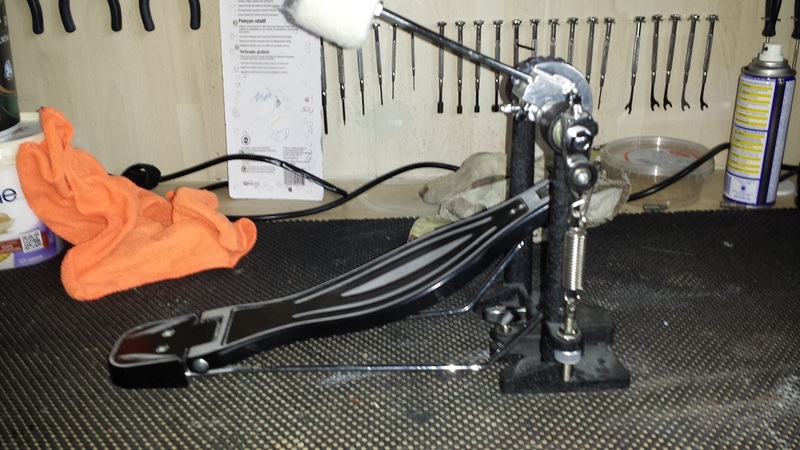 Of course a bass drum pedal to convert is required too. Not all pedals are suitable candidates though. 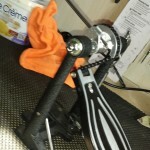 On some entry level pedals the chain is riveted to the cam and pedal. 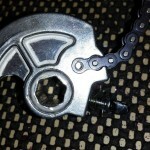 Should you wish to convert one of these, you will have to either drill the rivet(s) out, or split the chain. Neither impossible, but it will add about five more minutes and does require a little bit more skill. 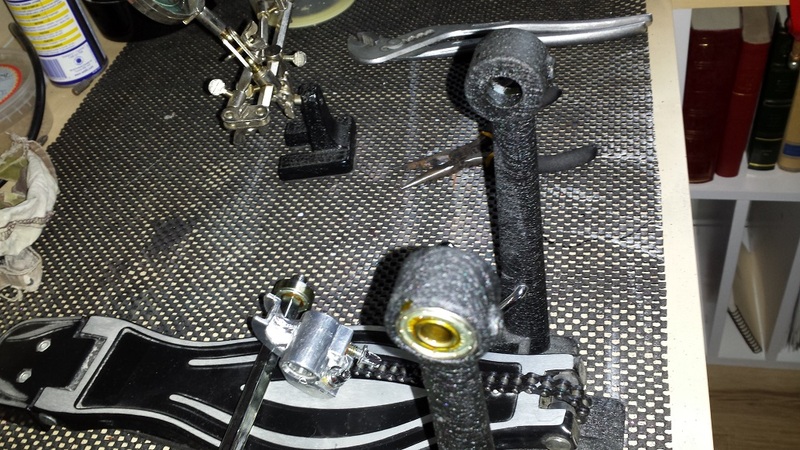 Most direct-drive pedals won’t work either. Remove the beater. 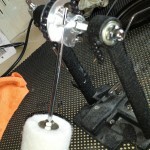 Loosen the spring tension and unhook the spring. 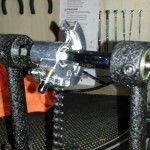 Detach the spring hook assembly from the shaft. 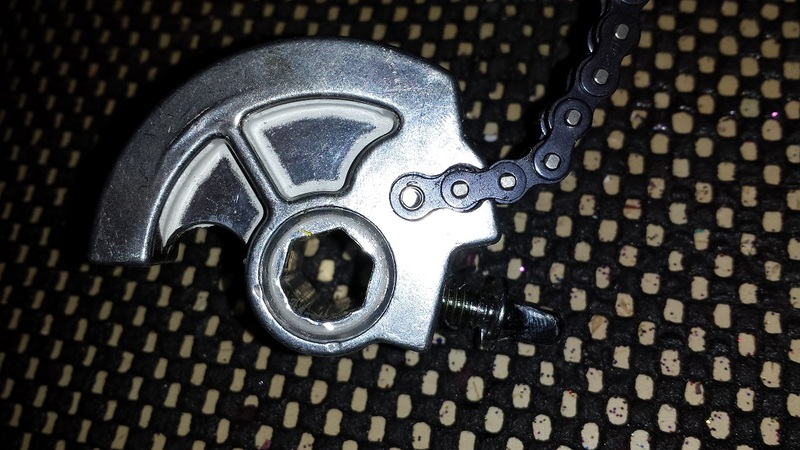 In most cases the spring hook assembly is fastened with a square head bolt (Drum tuning key), but some may require a hex key or other tool. 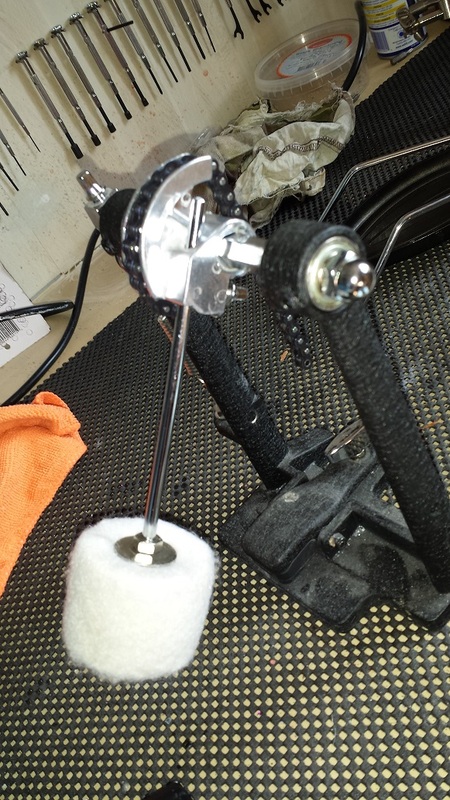 Sometimes prying with a small screwdriver between the pedal post and the spring hook assembly is required to get it to let go. The shaft may be fastened with a nut on the opposite end of the spring. 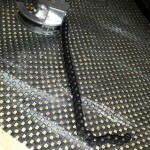 Check for any fasteners that may lock the shaft in place. 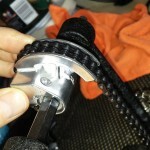 In this example we left the nut on since the shaft can slide out either way. 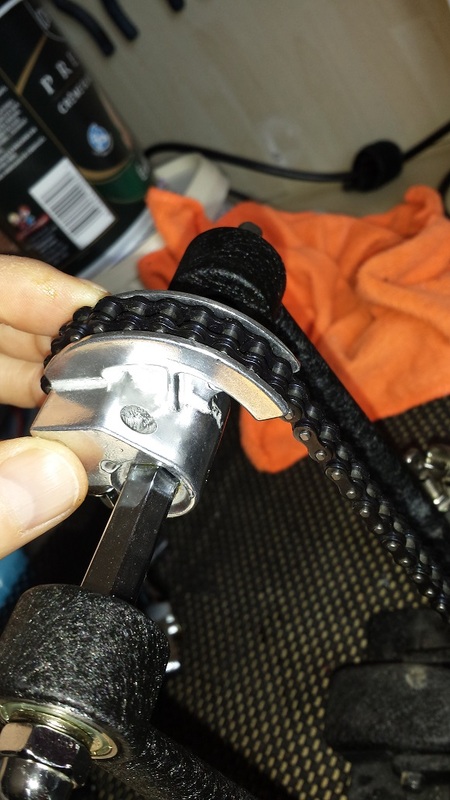 Loosen the bolt that locks the cam on the shaft and slide the shaft in whichever direction it prefers to. The shaft should come out without excessive force. 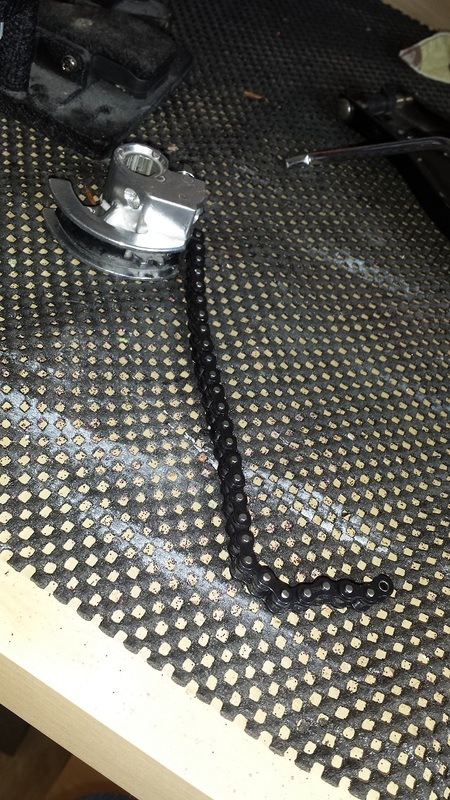 The chain can be detached at either end. On our sample pedal it initially looked like it could be just slid out from the cam, but it turned out it was easier to just unscrew it from the pedal board. 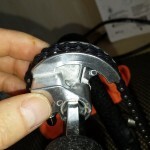 With the chain detached at one end, reverse the direction of the cam, so that the hole for the beater faces away from the pedal. Slide the shaft back in through the first post, ensuring that the flat part on the end that the spring attaches to is facing upward. 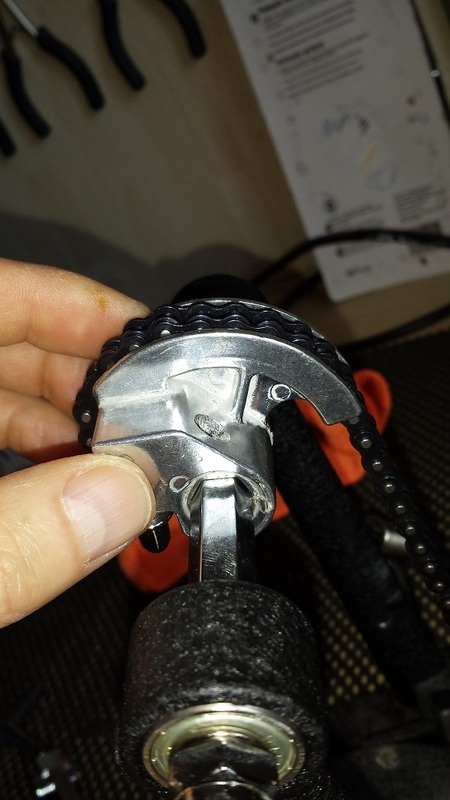 (Or whatever direction the lock bolt on the spring hook assembly faces). Hold the cam in it’s ideal “neutral” position. (The hole for the beater horizontal, or slightly downwards-pointing.) and slide the shaft through the cam and the second post. Without tension on the spring the beater will hang down at an awkward angle. 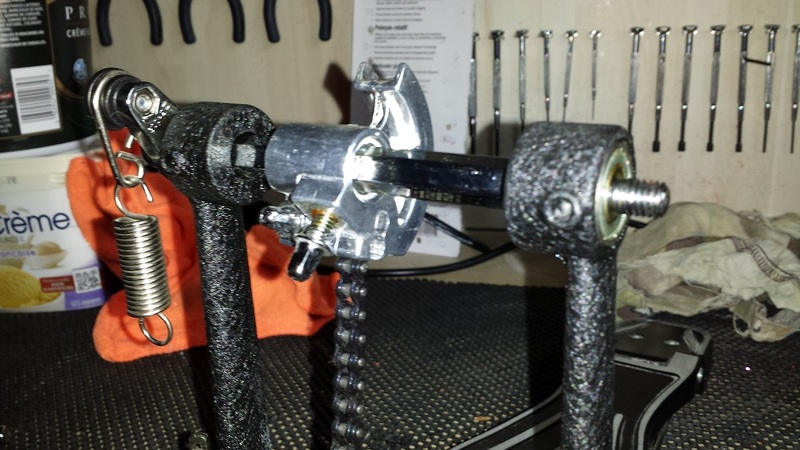 Re-attach the spring hook assembly and any locking fasteners. Tension the spring and re-install the beater. Open a beverage of your choice and pat yourself on the back. That’s all there is to it. 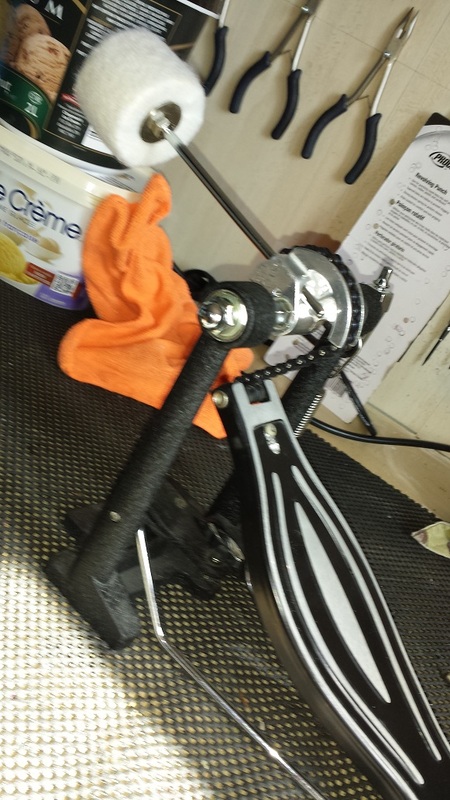 DIY Cocktail Pedal Conversion Complete! In the near future we will be publishing an article on converting a regular drum kit to a Cocktail kit, at which time attaching the pedal will also be addressed.